Sanigar Events and S4C are proud to announce a stacked night of Championship boxing at the Newport Centre on October 27th. 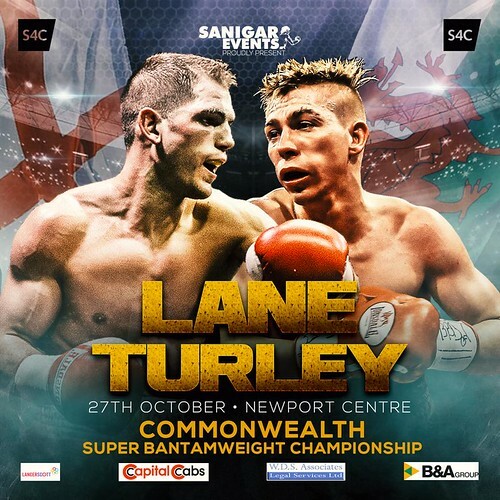 In the headline event reigning Commonwealth Super-Bantamweight Champion Ashley Lane will take on former champion Robbie Turley in an exciting contest that could propel the winner on to add more prestigious domestic titles to their collection. Turley won the title in sensational fashion with a TKO over Bobby Jenkinson back in April 2017, he then vacated the belt allowing Ash Lane to win the vacant championship on points against South African Michael Ramabeletsa. Both men are hungry to push their careers forward and the boxing community is split on who wins this intriguing match up. There are two Welsh Title fights supporting the main event. In the first, Mountain Ash’s road warrior Tony Dixon will box Pontypool’s Kieran Gething for the Welsh Welterweight Title. This will be Dixon’s first bout since a brave points loss to highly rated Ted Cheeseman at the York Hall. Gething by contrast has boxed twice in 2018 and extended his unbeaten streak to 6 fights, putting to bed an early loss to Bristol’s Aaron Sutton. The second Welsh Championship is a highly anticipated contest between two come forward brawlers, bragging rights will be on the line when Newport’s undefeated puncher Daniel Barton collides with Abercregan’s tough guy Geraint Goodridge. The prize at stake will be the prestigious Welsh Middleweight title and fans are expecting a fight of the night encounter. Gavin Gwynne will make a big step up against undefeated Myron Mills from Derby as the reigning Welsh Champion squares off against the reigning English Champion in a British Title eliminator. Gwynne has impressed since his 2016 debut, racking up 9 straight wins and capturing the Welsh title against the durable Henry Janes last year. Gwynne will need to utilise all of his ring craft to outbox Mills who boasts an impressive 50% knockout record stopping 4 out of his last five opponents. The collision of Wales vs England/ Boxer vs Puncher will be a fight not to miss. Olympic silver medallist Fred Evans steps up against Ryan Toms in a 6 round contest, Fred is keen to build momentum towards the end of this year and hunt down titles in 2019. Cardiff light heavyweight Nathan Thorley will also feature, Nathan is now working with experienced trainer Gary Lockett and will look to try out an improved style on October 27th. Swansea featherweight Kristian Touze aims to get back to winning ways after a surprise draw with Alec Bazza in April. Robbie Vernon will face Barry’s Joe JD Jones in his debut contest. Fellow welterweight debutant Jake Tinklin from Risca begins his journey as a professional and Sion Yaxley 2018 Welsh Champion complete the line up. Yaxley will be the first boxer from North Wales to fight live on S4C and Sanigar Events are excited to be signing fighters from all over Wales as they continue to work closely with the channel. Tickets are available on the door and are priced at £75 VIP Ringside & £50 Ringside, £35 Unreserved Seating. Under 16’s £10 accompanied by an adult.